Mega Happy Hunter: We Survived. We did it! We got all moved in! My body kind of feels like I'm recovering from major surgery, but we are alive. There's definitely going to be some adjustments. The girls are sharing a room now and so far that is going great... Minus K being banned from her room during nap time. My parents house isn't Brynlie proofed. Yesterday I decided to try and clean something and moments later found her eating out of the garbage can. It was disgusting and kind of funny at the same time. She really is more puppy than human, I swear. She also won't stay out of the dog dish... Coincidence? I think not! Kennedy is adjusting better as the days go on. She has some things to get used to as well. For example, we never watched anything but movies, Netflix, or Hulu at our old house, so Sunday when we turned on the TV for her so we could unpack and her first ever commercial break happened, it was a little traumatic. She had no idea where her show went. I laughed. She cried. Overall I am feeling great about being here and I'm excited for the future. Cory gets along great with my parents so living here, although not ideal, isn't too bad for him, either. We know it's temporary and someday we will have our own home again. I've been dying to get back to a normal routine. I hate having chaos in my life. I gained 5 lbs from the stress and eating takeout last week. Eep! So this week its back to the gym every day, running 3 days a week, and eating nutritious meals. Yay! 7 weeks until this marathon training nonsense is over. I literary cannot wait to be done with it. I totally forgot my parents have a DVR and on demand. I can smell the laziness in the air. It only takes me 7 minutes to get to the gym now. Because I was pregnant last time we lived with my parents, my brain is programmed to eat. All I wanna do is eat. Gotta kick that in the nards ASAP. 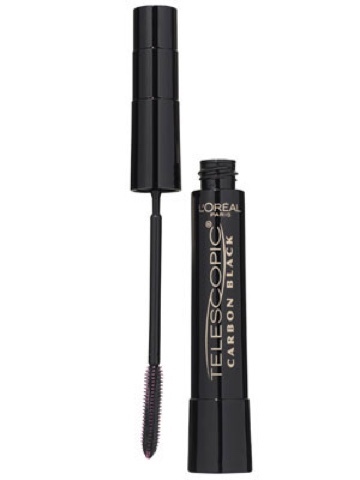 This mascara is AMZAZING! Coming from someone who has tried lots of them, I can put a well-tested stamp of approval on it. If you like long, spidery lashes, go get yourself a tube. 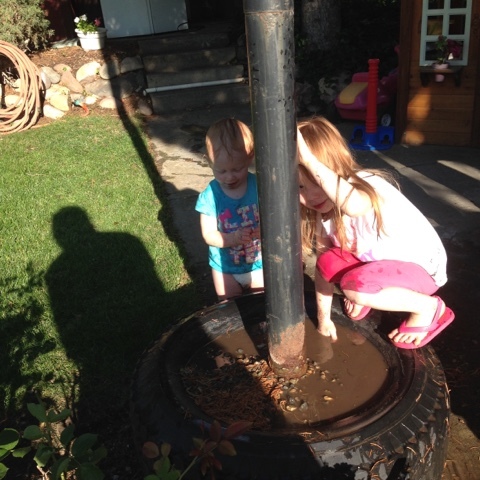 And because I haven't taken a single picture in the last 5 days, here's one my mom took of the girls getting filthy in leftover rainwater in the basketball hoop and loving every minute of it. This is a strong reason why we moved; to be outside. It's what being a kid is all about. The craziness is dissipating a little bit. I promise to get back on my blogging game very quickly.